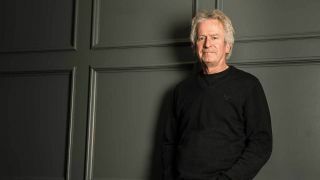 With his latest solo record, Five, Tony Banks has returned to one of his first loves: the orchestral album. It follows 2004’s Seven: A Suite For Orchestra and 2012’s Six Pieces For Orchestra, as well as 2015’s all-encompassing solo work box set A Chord Too Far. While other Genesis alumni Steve Hackett, Mike Rutherford and even Phil Collins have made their way back into the limelight, Banks, by his own admission, likes “to relax and know that everyone is looking at someone else on stage. I don’t want to be the centre of attention”. It’s fair to say that you’re the most overlooked solo artist from Genesis. I suppose so. When it comes to the more classical stuff, I seem to have got more of a niche going. It would be nice to have an audience to write to, and that’s what’s a bit more frustrating with the other solo albums I’ve done. But I think this is more of a natural thing for me to do, these orchestral pieces, and I’m very happy to do them. Do you still get excited by creating new music? God yes. For me it’s always been the writing that’s given me the biggest thrill. When we were working as a group it was the same thing. You feel you’ve hit on something and it really works for you, it really gets you going. The box set reminded me how much I like your film score work. Why did you stop doing that? Not been asked, sadly. I don’t think anyone comes knocking any more. I think you have to do the knocking, and I’ve never been very good at that. Mike Rutherford, for example, he’s very good at putting his foot in the door. Have you been to either a Phil Collins or Mike And The Mechanics show? I saw Phil at the Albert Hall. It was good. I think he got a lot better as it went on. The band was fantastic, but he is very static these days and he can’t quite do what he used to do; he can’t do the tambourine dance any more, and I used to like that. I could just sit and doodle for a bit while he hit his head with the tambourine. Mike did a great show too, and I’m particularly fond of Andrew Roachford. He’s a very good singer. I really enjoyed them doing [Roachford’s 80s hit] Cuddly Toy. Did you read Phil’s autobiography? It was quite revelatory in places. No. I read Mike’s book and I didn’t like that very much, so I’ve decided not to read Phil’s book. I think Steve [Hackett] is doing a book and I won’t read that either. I’ll keep it even and not read any of their books. I felt that Mike’s book was a bit dismissive of me, actually, and I told him that and he just muttered a bit. We’re still friends. It was inaccurate, for a start, there was a lot in there that wasn’t right, and he passed over certain moments that I thought would have had a bit more time dwelt on them. It’s not a big deal, I just think the trouble is that when you read stories about yourself, even if it’s good you don’t like it in a way, it never sits quite right. Will we see An Evening With Tony Banks show any time soon?